MONKEYS ARE MY FRIEND: Coasters! Today was a fun day - I crocheted some coasters. For some reason, Dan and I seem to be have misplaced a fair number of our coasters. We are always running out and our living room "set" is rather mismatched. Which gave me a perfect excuse to try felting a crochet project. 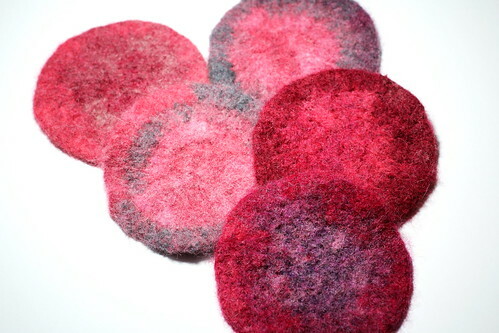 Making felted coasters! Yay felting! I think it's pretty neat! So these coasters are to be my set and next up is making Dan his own set with some more boy-friendly colored yarn (blue and yellow). Very exciting! Yay for felting! Woohoo for coasters that look super cool!! and YAY for boy colored yarn! neato! Yay! I still haven't gotten around to boy coasters yet but maybe this weekend??? I'll certainly share, that's for sure!